Join us for the #BConnectedTO Twitter Party! On the Leading Edge of Social Media! 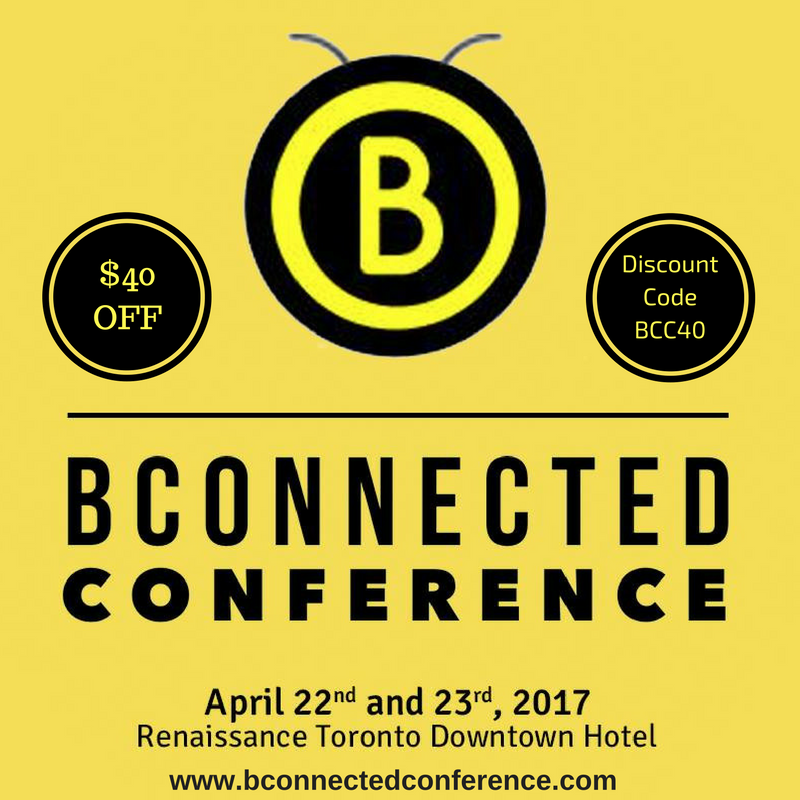 The BConnected Conference will be held on Saturday April 22nd and Sunday April 23rd, 2017 at the Renaissance Toronto Downtown Hotel. The conference offers amazing components: interactive sessions, keynote speakers, one-one one speed networking with sponsors, an exhibitor’s hall as well as Social Networking Events, and more surprises! They will have speakers who will be sharing their skills and experience with attendees to help obtain hands-on and useful information to enhance their social media and blogging skills. Attendees will also be able to increase their network by connecting with fellow influencers and entrepreneurs, after all, being connected is what the conference is all about! for the #BConnectedTO Twitter Party! Where: Twitter, Twubs or Tweetdeck! To learn how to participate in a Twitter Party, check out this page! Fabulous prizes from BConnected Conference sponsors will be drawn at the end of the Twitter Party! Prizes will be announced the week of the party. Please RSVP by adding your Twitter handle to the linky below, so you will be eligible to win! More information on the BConnected Conference, visit the website! In order to win a prize you must be a legal resident of Canada who are at least 18 years or older in their province/territory of residence on the date of entry, follow your host, BConnected Conference, have filled out the Linky entry form and participated in the Twitter Party following the hashtag #BConnectedTO. You must be a registered user on Twitter (a third party Web site) to participate. If you do not have a Twitter account, follow the onscreen instructions to register for a free Twitter account at www.twitter.com. Prizes will be drawn at the end of the Twitter Party using Twitter Twitter Chicken Dinner. At this time, a random draw will be held from among all eligible entries received to select a Twitter Party participant eligible to win a Prize. The entrant eligible to win will be requested to fill out a winner form by April 2nd, 2017 with his/her your name, shipping address and phone number for prize delivery. The Winner will be contacted via email within 7 days of the conclusion of the Twitter Party Period. Odds of winning depend upon the number of eligible participants registered and that participated during the Twitter Party Period. Winner must accept the prize as stated. Prize cannot be substituted, transferred or exchanged or surrendered for cash, except at the sole and absolute discretion of the Twitter Party Sponsors, who reserve the right, at their sole and absolute discretion and for any reason, to award a substitute prize of equal or greater value, including without limitation, a cash award. Unclaimed prizes will not be awarded. Allow up to 6 weeks to receive a prize. By entering this Twitter Party, you agree to the terms and conditions. No purchase is necessary to win and void where prohibited by law. Enter your Twitter URL (eg. https://twitter.com/BConnectedConf) in the URL Field and your Twitter Handle (eg. @BConnectedConf) in the Name field. Previous Post:Planning a Party? Evite Has You Covered!